Advanced Forms is a powerful form builder which takes advantage of the flexibility of Advanced Custom Fields. It gives you access to the full set of field types provided by ACF such as repeaters, date pickers, and galleries as well as fields provided by third-party plugins. This robust base makes Advanced Forms the perfect form builder whether you are creating a simple contact form or a custom user editing experience. Advanced Forms Pro takes this even further making it easy to create forms for any post type and forms for editing users. We've also included providing powerful integrations with Zapier, Mailchimp, and Slack. Send any number of emails to users and administrators with beautifully formatted data. Connect your Slack workspace to instantly get a message for each submission. Let your users create and edit posts and user profiles on the front end. 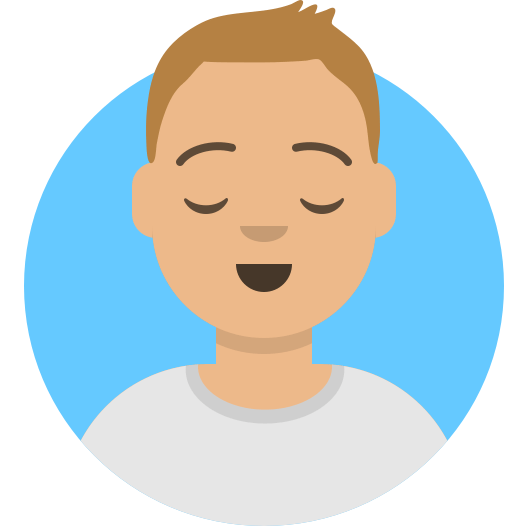 Sign up visitors to your Mailchimp mailing lists, or use the Zapier integration and connect your form to thousands of services. Do you want to let your visitors provide info and register themself? 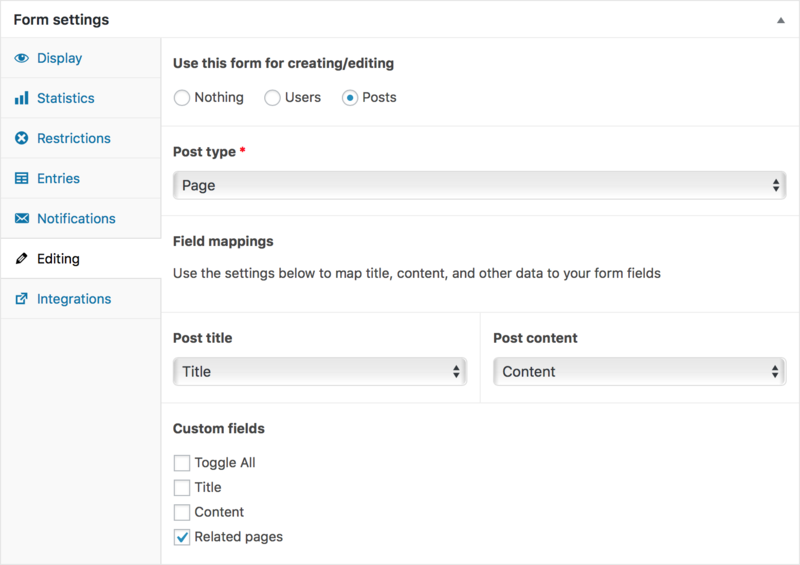 Or maybe you want to let your users publish and edit posts with custom fields? Advanced Forms Pro makes it a breeze to build forms which can create and edit posts and users. 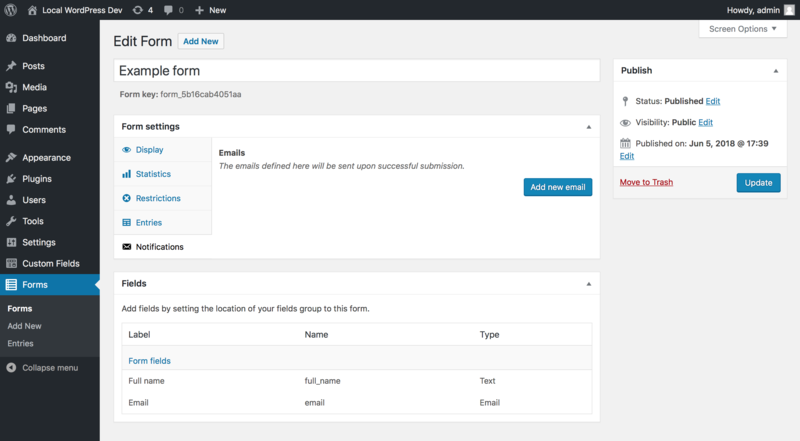 The intuitive interface lets you connect form fields to post title and content as well as username, email, password, and more. Because Advanced Forms is built on ACF, any custom field shared between form and post/user can be automatically saved. The free version is a full featured form plugin with support for all ACF fields. The Pro version provides tools for building post and user editing, integration with third-party services, and priority support. 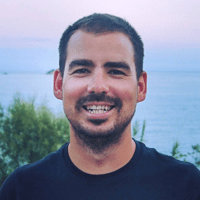 The Advanced Forms Pro was created by Fabian, a Web developer based in Sweden with the help of Aaron based in Melbourne, Australia.